It has become pretty common for me to have one or two unfinished projects on my bench or the shelf, because “I just can’t find the time” to complete them, or because I’m “waiting for something the project needs”. And both things happened in one way or another with a Linear Power Supply kit that I bought after watching a review/build by VoltLog. I ordered the kit online, and before it arrived I went and purchased a 24V 3A transformer from a local electronics store, eager to build and test the kit as soon as I got my hands on it. 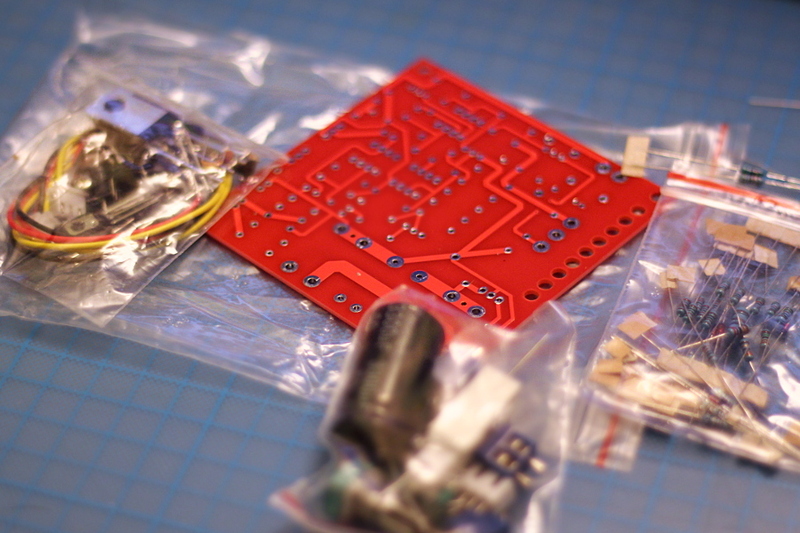 By the end of July I received and soldered the kit. The enclosure arrived later I think. Problems started like a minute into testing the freshly soldered circuit. I inadvertently cranked up the current to the max (the pot was wired backwards) and the very thin wires that I hooked to the output melted. I wasn’t using a heatsink on the main transistor either, and in a matter of seconds there was magic smoke everywhere and 0 volts at the output. After probing the circuit with my multimeter I suspected that the op-amps (which definitely looked a bit low quality and off-brand to be fair) were the ones at fault, so I got a few of them from a reputable local source the day after, but unfortunately that did not solve the issue. I then decided to test the big D1047 power transistor with a component tester (I mean…It’s a transistor after all, right?) and unsurprisingly it was showing almost zero gain, which led me to believe that it either died in the incident, or the component tester was unfit for testing such a “high power” component. I ordered a few D1024 from eBay anyway (because it’s an uncommon transistor and I couldn’t find a suitable replacement at local stores) and I also ordered another kit, just in case the transistor was not the problem. Fast-forward to almost two months later: The transistor arrived, and after replacing it on my circuit the supply was working again! Now that I was able to better test the supply (this time more carefully and with a heatsink) I realized that the transistor definitely needed serious cooling to operate. I mean, I knew that it was going to dissipate energy as heat, just didn’t know how much it was going to be, so a fan was almost mandatory, despite the massive heatsink I got for it. Unfortunately I did not have a fan small enough to fit in the enclosure, so I had to order one online. This was probably mid September or something. October went by, and it was the first week of November already. 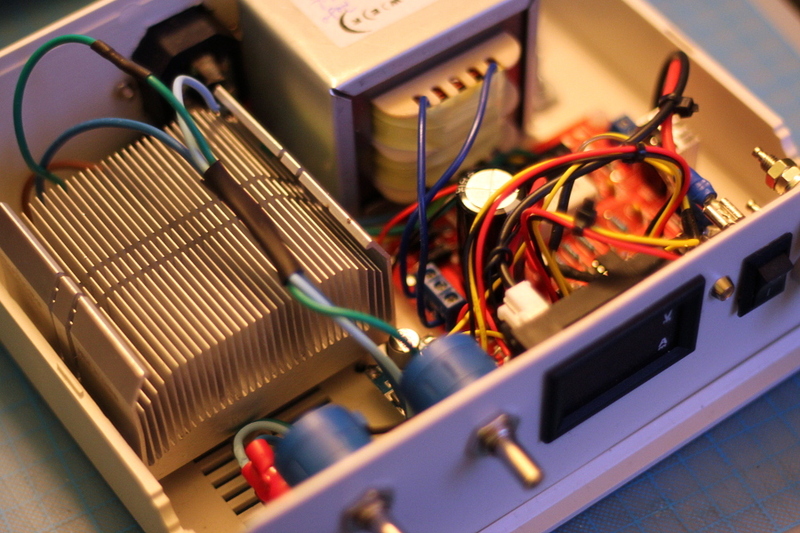 I had recently made an enclosure for another power supply while this unfinished kit was collecting dust on my shelf. According to the tracking information (and my previous experience with shipping) the cooling fan was not going to be in my hands until at least one or 1 1/2 weeks more, but I reckoned that I could still make progress with the build, and I was just being lazy. I just didn’t install the items inside the enclosure under the excuse that “I don’t have the fan yet”. But I already knew the size of the fan from the eBay listing, and I could always add some margin when installing everything else just in case, so there was no real excuse for not taking this project one step closer to completion, and that’s precisely what I did that weekend. The supply’s PCB includes a 24V regulator (7824) on board, directly fed from the transformer’s rectified output (~28V), which is where you are supposed to connect a fan. But the one I got is 12V only. Taking 24V (or the ~28V directly) down to 12V with another linear regulator was going to be a waste of energy (and another source of heat inside the unit), so I removed the regulator and solderer a 2-pin header in its place, straight to the input and ground pads, and I used the ~28V rail to power a DC-DC buck converter, which I set to 12V output. That’s way more efficient, and gives a nice , stable 12V output that I can use to power the Volt/Amp meter and the yet-to-arrive fan. Please ignore the AC wires running straight over the heatsink. The slots and holes for the components were made with a Dremel tool. I do not have a step cone drill bit so the larger holes were done carefully with a standard dremel cylinder grinding stone. After testing that everything fitted and worked as expected, I designed a better-looking panel on Inkscape, and printed it on photo paper. This was aligned and glued to the front panel, and the holes and slots re-traced with a hobby knife (which worked surprisingly well). I also had to reduce the length of the shaft to mount the potentiometer knobs a bit closer to the panel. This was also done with a Dremel, but using a Metal cutting disk. I should mention that despite the claimed “30V 3A” output capacity, I was unable to get anywhere near 3A at 30V. My supply seems to max at around 55W of power, so the best I get is ~1.8A at 30V, Under 18V I have no problems getting the full 3A. I don’t know if this is a problem of my transformer (too weak) or the circuit, but it’s enough for what I do. While it was still missing the cooling fan, the supply was completely operative at this point (being very careful of not overheating the unit, though), but I still was eager to receive the fan to finally close this one for good. By the first days of November the package with the fan had arrived to our country, but got stuck in customs. They asked me to send the invoice and proof of payment so they could calculate the “appropriate taxes” (Which is almost a joke. They charge whatever they want apparently, even up to 50% of the order, based on made-up numbers, but that’s another story). I sent that information straight away. Since holidays were coming the package was set to be there for “a little longer than usual”. The supply works great and I have no major complaints, except perhaps that the fan is really noisy, but I prefer a noisy supply, that one that catches fire after 10 minutes of operation. I want to replace the volt meter for a 4-digits one that I already ordered it, so if I’m lucky I’d be able to change it by the end of this year (fingers crossed). But as it is now it works, and it should be safe to operate for extended periods of time. Now, I’ve heard that the design of this circuit is rather atrocious. According to several online sources, a few components seem to be running outside of their specs, which is normally not recommended, at all. Having said that, I’ve seen many users who’ve been using this supply for a long, long time now without problems, and several recent builds (my own included) have been operating flawlessly as well (although 2 weeks is pretty much nothing). 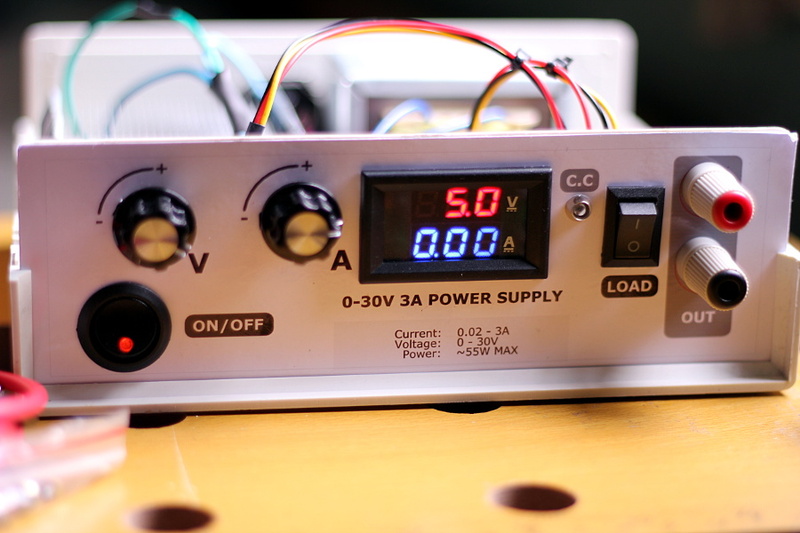 Unless my supply fails in the next few months, this is a kit that I’d really recommend to anyone looking for a decent (although basic) power supply for their labs. 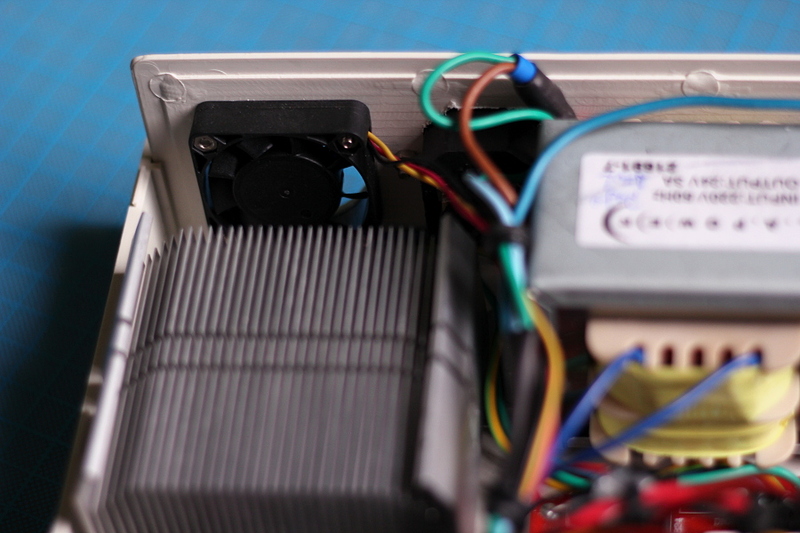 It’s fun to build, and it seems to work well, as long as you use a proper heat-sink. It also seems to be quite resilient; My first fail with the supply was when I tested it with very dodgy and thin wires, and no heatsink, and despite all the smoke and melted cables, the only thing that died was the power transistor. This entry was posted in Electronics, Lab. Bookmark the permalink.